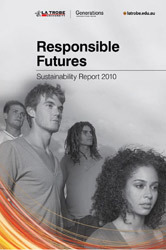 La Trobe University is pleased to release its 2010 Sustainability Report Responsible Futures. The report covers the University’s social, environmental and economic footprint and outlines future performance targets. The Responsible Futures report is externally assured following the Global Reporting Initiative's sustainability reporting guidelines by sustainability consultancy Net Balance. External assurance demonstrates the University’s honest and transparent appraisal of the impact the University has on its community and the environment. Responsible Futures, La Trobe University’s first Sustainability Report won the award for best first-time report at the Association of Chartered Certified Accountants Sustainability Reporting Awards in August 2011. Read the media release. In April 2012 Responsible Futures won 'Best First Time Report' at the Corporate Register global reporting awards in London. Read the media release.